Denver, Colorado based doomed heavy metal quartet KHEMMIS are proud to announce their North American Desolation 2019 tour. The 16-date tour will kick-off on July 11th at Growlers in Memphis, Tennessee. The trek will make stops in Richmond, Philadelphia, and Detroit before concluding on July 28th at Nightspot in Bloomington, Illinois. 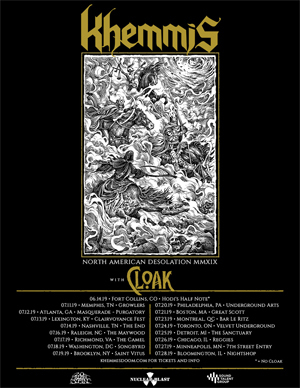 Joining the band on the tour is Atlanta, Georgia's metal quartet CLOAK. Prior to the main run KHEMMIS will play a stand alone show on June 14th at Hodi's Half Note in Fort Collins, Colorado. KHEMMIS comments, "We're excited to hit the road for our first proper headlining tour in support of Desolation. This trek features our first Southeastern shows as well as dates in some of our favorite cities/venues, including Saint Vitus in Brooklyn and Reggies in Chicago. If that wasn't enough, we're bringing black 'n' roll maniacs CLOAK with us! Make sure you grab your tickets early, since these are our only eastern US and Canadian shows for 2019. Brush up on the lyrics, practice your air guitar moves, and catch us on tour this summer!" KHEMMIS will be touring in support of their latest album, Desolation. KHEMMIS’ passion for progressive and soulful heavy music is more evident than ever in 2018’s Desolation. Though undeniably influenced by doom and classic metal, to tag the quartet with those labels doesn’t do justice to what they’ve accomplished; a perfect representation of modern heavy metal that integrates the past in a way only possible with the faculty of hindsight. It's impossible to ignore the lengths that the four piece goes to in order to master their craft and produce a highly unique form of heavy sound. Their magnificently uplifting, yet sorrowful groovy riffs weave the listener along on an unparalleled journey. Desolation is not just the best KHEMMIS record to date but a testament to the quality and evolution that heavy metal is still capable of. Having worked for the third time with Dave Otero of Flatline Audio in Denver, the band and producer achieved a deep mutual understanding, able to arrive at the perfect symbiosis of song writing, arrangement, and production value.